Reliance Animation & Rohit Shetty Picturez’s Little Singham, launched in collaboration with Discovery Kids, has added another feather in its cap by winning the Best Property IP Award (Entertainment Licensing Property) at India Licensing Expo (ILE). ILE is India's first and most influential brand licensing show. The event witnessed a participation of more than 500 global and domestic companies and it was supported by LIMA (Licensing Industry Merchandisers Association). 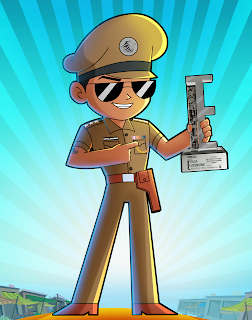 Little Singham animation series, inspired by ‘Singham’, one of Bollywood’s biggest blockbusters and mentored by ace director Rohit Shetty, is creating history across dimensions. The IP has helped in propelling ratings of Discovery Kids by more than 400% this year. ‘Little Singham’ Mobile Game added to the IP’s success hitting the top of the charts in the Arcade section by garnering 3 million downloads within the first two weeks of its launch.